Evans, Marshall & Pease, P.C. is first and foremost a professional corporation for the practice of public accounting. We have one local office located in Rolling Meadows, 25 miles northwest of the Chicago Loop. All of our audits are conducted under the direct supervision of a licensed Certified Public Accountant. Quality is our priority. Our small firm can offer more attention than the traditional firm, while we are able to offer a full range of accounting, auditing or consulting services. Evans, Marshall & Pease, P.C. has been in continuous existence since 1917; we have mutually benefitted from successful relationships. Our philosophy includes retaining sharp, focused professionals to do quality work that keeps clients moving forward. Long ago, we made the commitment to the quality of our work, not the quantity of our work. Evans, Marshall & Pease, P.C. is committed to excellence in the services that we deliver. Our professionals undergo numerous training programs involving financial reporting, auditing, not-for-profit accounting, and governmental accounting, both on the local and national levels. We strictly adhere to the continuing professional education requirements of both the American Institute of Certified Public Accountants (AICPA) and the U.S. Government Accountability Office (GAO). 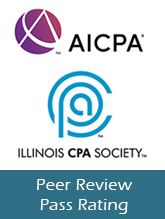 Every three years, Peer Review of our firm is satisfactorily performed through the Illinois CPA Society. Our attention to achieving the highest quality service is always evident.